RIO DE JANEIRO, BRAZIL – For many Americans and fans of the NFL around the world, September means the beginning of another exciting season of American football. 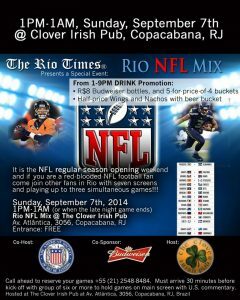 This year The Clover Irish Pub in Copacabana is set to be a hub for watching the games, and on Sunday they kick off the opening weekend by hosting the Rio NFL Mix along with the American Society of Rio de Janeiro (AmSoc Rio) and The Rio Times. The Rio NFL Mix will celebrate the opening weekend of the American football season, image recreation. Watching the NFL in Rio has changed dramatically in the last five years, with high-speed internet more available, and an increase in local Brazilian television coverage, there are more options than ever to catch a game. However for many, there is no substitute for cheering on your team with friends in a comfortable bar with plenty of food, drink and entertainment. Recognizing this, The Clover Irish Pub has invested in the ability to not only play whatever games are showing locally (usually one on Sunday), but also – at the same time – stream any game direct from the United States across seven flat screen TVs. They are also able to have the U.S. commentary running through the sound system, including commercials from back home. Michael Royster of AmSoc Rio explains the organization has been around for almost one hundred years (founded in 1917) and it’s their prime mission to promote American traditions. While these certainly include Thanksgiving and 4th of July and Pancake Breakfasts, NFL football has become a tradition, replacing MLB (Major League baseball) in popularity. 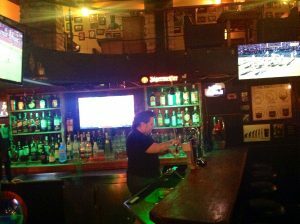 The Clover Irish Pub has seven screens and can play three different games simultaneously, photo by Jay Forte. AmSoc Rio will also have membership brochures on-hand for anyone interested in learning more about the benefits of joining group, as well as a survey for members to help decide where to hold Thanksgiving Dinner this November. The Rio Mix event will be on Sunday, September 7th, and go from 1PM-1AM, or whenever the late night game ends. A special drink promotion will run from 1-9PM and include; R$8 Budweiser bottles, and 5-for-price-of-4 buckets, half-price wings and nachos with beer bucket, and if you wear your team’s jersey and get your first beer free. In addition if anyone orders five shots, they will get The Rio Times T-Shirt for just R$10 (while sizes and supplies last). Normal prices are R$30, and will be available on Sunday.